"Actually...we're all going on a luxury beach vacation, courtesy of Tatyo-Chips!" Riverdale has its fair share of popular characters. None of them take that popularity so seriously that they'd be willing to ruthlessly kill the others and display their bodies as trophies. That's something for another character. And don't think the fact that the Predator finding his way to Riverdale is a vacation. In Archie vs. Predator #1 from Dark Horse, it's pretty clear he came to party in a much more violent way. The issue is written by Alex de Campi, penciled by Fernando Ruiz, inked by Rich Koslowski, colored by Jason Millet and lettered by John Workman. America’s favorite teen meets the galaxy’s fiercest hunter! Archie and friends hit Costa Rica for Spring Break, where party games and beach games are soon replaced by the Most Dangerous Game. What mysterious attraction does the gang hold for the trophy-collecting Predator, and will the kids even realize they’re in danger before it claims them all? Archie vs. Predator #1 is being billed as an extraordinarily unlikely crossover and with good reason; the two properties couldn't be farther from each other. It's a fact no lost on de Campi, who does a fantastic job of nailing the tones associated with both universes. 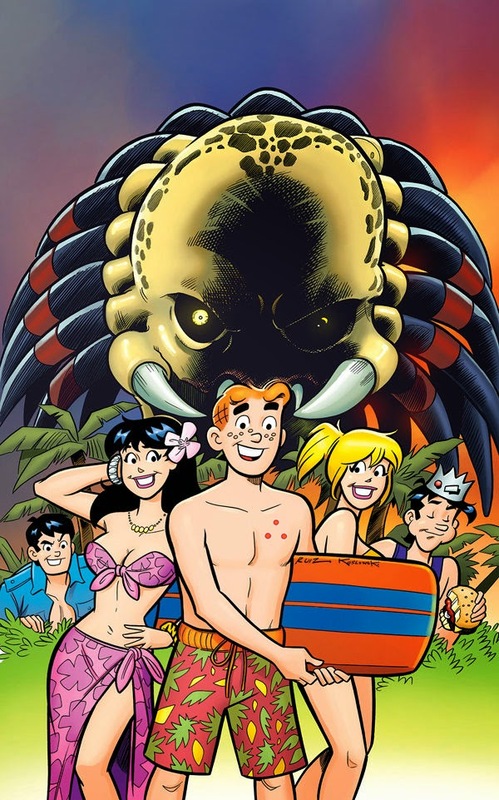 On the one hand, Archie and the gang are given a classic Archie story, where the group vacations on a tropical island courtesy of a sweepstakes win. On the other hand, Predator is on the same island and doing what he does best: killing for trophies. de Campi blends the two worlds together flawlessly, offering a tone befitting of Archie when they're the focus and a much darker tone when Predator makes an appearance. The plot is a perfect fit for both universes as well, as it ensures that the Predator doesn't just encounter the gang once and then moves along. Part of what appeals most about Archie vs. Predator #1 is the pencils by Ruiz that maintain a familiarity about them. The book looks predominantly like an Archie book, with renderings of the Predator done in a way that makes it feel possible for him to really show up in Riverdale. Much of that has to do with the fact that Ruiz has illustrated Archie for decades, so he's a natural choice for blending the two completely disparate worlds together into one. He's in fine form here as well, tapping into the newspaper strip feel and making Archie's group the center of attention while at the same time reminding the reader that the Predator is lurking in the shadows. Koslowski's inks are strong and clean, providing plenty of emphasis on characters and settings. Millet's colors are sufficiently tropical and go a long way to belie the terror on the island with the kids. Archie vs. Predator #1 doesn't sound like it would work, but boy, does it work. The worlds blended together much more effortlessly than one would think, as simply inserting the Predator into the Riverdale setting is brilliantly simplistic. de Campi blends the right amount of joy and pain throughout the story, walking a fine line that injects a horror movie aspect to the story. The easily recognizable pencils by Ruiz convince the reader that this is an Archie book, yet there are panels where he's not shy about reminding the reader that Predator is hanging around as well. Archie vs. Predator #1 is a lot of fun for a first issue in a completely unconventional crossover, loaded with a special, one-page side-story that could be a genius crossover in its own right. Archie vs. Predator #1 is in stores March 25.